﻿ Myers Inn Museum - Ohio. Find It Here. The Myers Inn Museum is located on the Village Square and is listed on the National Register of Historic Places. 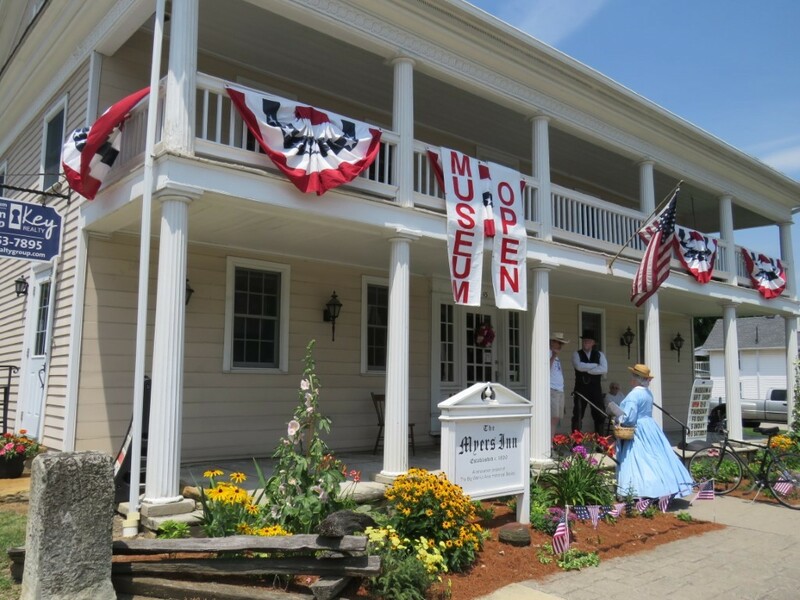 The Myers Inn was home to Lawrence Myers in 1816, a stage coach inn in 1820, and is now home to the Big Walnut Historical Society and exhibits of area memorabilia. In addition to historic exhibits of arts and artifacts, Civil War memorabilia, period dresses, and a gift shop, the Myers Inn also hosts history pageants, luncheons, teas, meetings, and other special events. The barn next to the Inn features a blacksmith's shop and livery stable. Visitors also enjoy the magnificent bronze statue of Civil War General William Stark Rosecrans sitting upon his horse as they arrive at Village Square.